I find particular satisfaction in making something from not-so-much. I save my Parmesan rinds to add depth of flavor to lentil soups. I save my vegetable trimmings make homemade broth. And when I made those risotto-filled chard rolls, I saved the chard stems to make this dish. I often cook chard stems right along with their leaves, chopping them into confetti and sauteing them with onions and garlic before adding the glistening green leaves to my pan. And I sometimes chop the stems up for my stock-trimmings bag in the freezer if I only have a few of them. But chard stems are a delicious vegetable on their own, with a sweeter flavor than the leaves and a bit of crunch or chew, depending on how long you cook them. This recipe is a longstanding family favorite. It comes from Jack Bishop’s A Year in a Vegetarian Kitchen, which I once checked out of the library. (I love getting cookbooks from the library.) 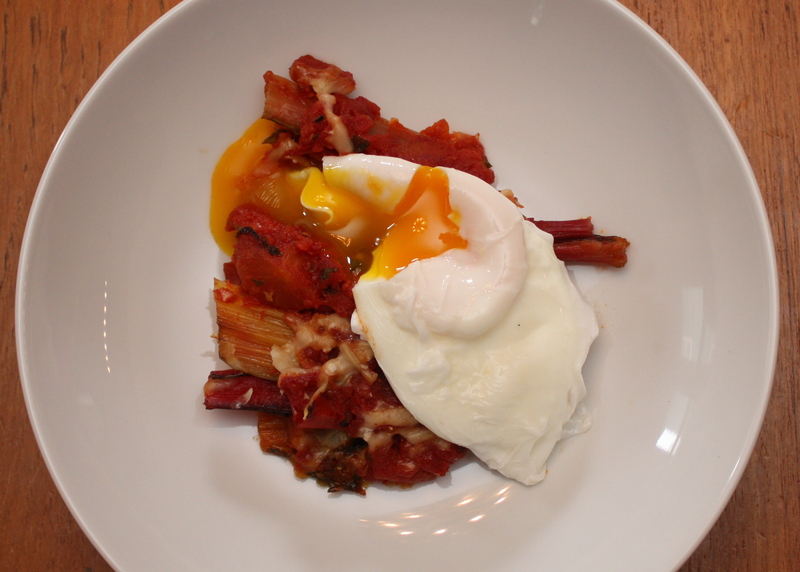 I sauce things up by increasing the tomato and often serving a poached egg on top, but you can do what you like. I also usually serve the sauteed chard leaves alongside if I didn’t already use them up to make chard rolls. This is one of those nice dishes where the end product seems to be more than the sum of its parts. We are about equally likely to make it for breakfast, lunch, or dinner. Which will you do? Baked Chard Stems with Tomato, Garlic, and Parmesan: Slice chard stems into 3-4″ lengths and simmer in broth or lightly salted water until tender, about 7 minutes. (I did this when I was blanching my chard leaves in broth the other day.) Meanwhile, make a tomato sauce by sauteeing a few thinly-sliced cloves of garlic in olive oil until golden, then stirring in a 28-oz. can/tetrapak/jar of chopped tomatoes. If you want to speed things along you can drain the tomatoes and save the liquid for a soup or put it in your freezer to make stock later. Cook the tomatoes down into a thick sauce, then remove from heat and stir in a handful of minced parsley. In a lightly oiled baking dish, layer half of the chard stems, half of the tomato sauce, then a handful of freshly-grated Parmesan. Repeat. Bake uncovered at 400 until the cheese is lightly browned, about 25 minutes. Serve alone or topped with a poached egg and/or sauteed chard greens. This entry was posted in Eggs, Food, My Favorite Recipes, Recipes, Vegetables By Themselves and tagged breakfast, cooking, dinner, eggs, food, healthy, lifestyle, recipes, vegetarian on May 21, 2012 by emmycooks. This is one of our favorites–I don’t think you’ll be disappointed if you try it! That chard is gorgeous. Totally picking some up today for sandwich wraps. I know what will be doing with the stems! What a lovely idea! I didn’t even know you could eat the stems. :) Thanks for sharing…I’ll have to try this. Love your blog! Those stems are gorgeous. Anytime you’re eating so much “color” you know it’s going to be rich in vitamins, carotenes and antioxidants and to make such delicious food out it? Genius! You should check out my muttar paneer (green peas and paneer) recipe. Posting it tomorrow. You’ll love it. It’s very similar but the sauce is even more delicious! Oh my gosh, this sounds amazing and chard is not something I have experimented with yet. I’m really excited to now after reading this post! You have been nominated for my NEW Food Stories Award for Excellence in Storytelling. Check out my site for the details (foodstoriesblog dot com). I love cooking chard stems! So good. Your photo is amazing too. The colors! I want to wear them! Oh yum! I love the color on the chard – beautiful! Vegetables are so pretty. It’s almost a pity to eat them. Almost. I am LOVING the creative ways you use the odds and ends that would otherwise be thrown out. I really appreciate that mentality! I’m new to your blog, but I really like it! I just checked out the vegetable broth post, as well. Thanks for opening my eyes to these uses for veggie scraps! Oh goodness, so colorful and nice! I’ve never tried chard, I should, maybe it’ll be one of the few veggies I like. Ha ha, you seem to know what you’re talking about, both in terms of veggies and my tolerance levels :P Thank you for the heads up! Really want to try this recipe ! Your blog is beautiful. This looks amazing as always Emmy. I love the pic of the rainbow chard, I have just planted some today in the garden. I hope they look this good! I enjoy the frugality of it all. Parmesan rinds are like a vegetarians answer to stock bones. I am a keen library goer, but I have a slight issue with late fines…Happy days! 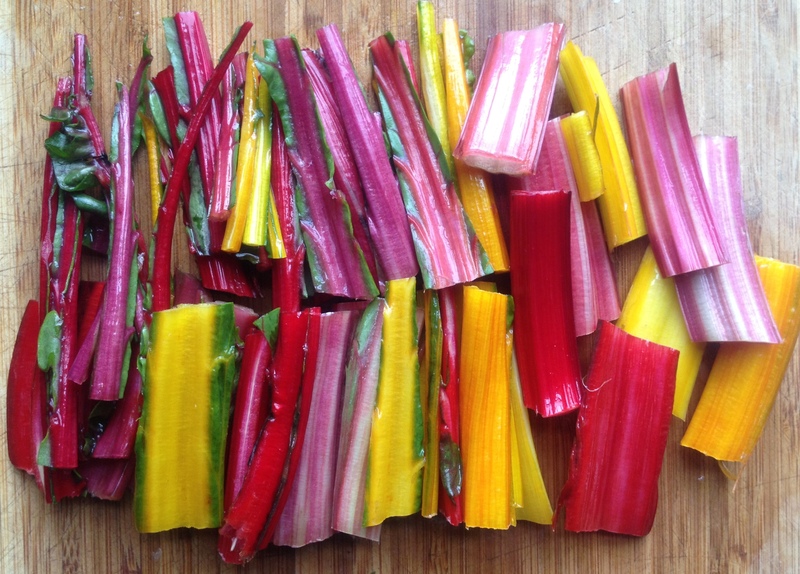 Rainbow chard is definitely a star in the garden–a cross between a vegetable and a decoration! I am bad with the late fines too. Which reminds me….oops. So beautiful! This is what I call kitchen art. My goodness- this looks spectacular. Finally, something to do with the stems. You’ve given me so many ideas!